Hard water is water that contains a high mineral content – specifically calcium and magnesium. You most often see the results of hard water in water spots left behind in your shower, or water faucets. It can even lead to buildup of minerals in shower heads and faucets around the house. Independent Water Services can recommend and install a water softener system for your specific needs. Start with a free water test and see if a water softener system is right for you. 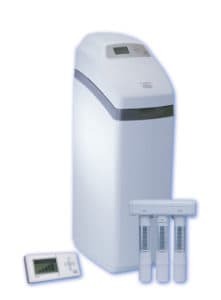 The latest technology in water softeners combines the power of wireless technology with your water softener system. For more information, contact us or visit this link from EcoWater to learn more.